Professor Harald Haas is widely regarded as one of most eminent innovators in communications technology today. His current research is focused on three main areas: optical wireless communications, spatial modulation and interference coordination in wireless networks. A finalist for the world Technology Award in 2011, his work on Li-Fi was featured by TIME magazine as on one of the "50 Best Inventions in 2011". Addressing an audience at an entertainment and installation technology event for the very first time,Li-Fi - Broadband Through Light is a speech that considers the application of using light, specifically light from LEDs, rather than radio waves to transmit data. Professor Haas's work on Li-Fi has profound implications for any industry that relies heavily on wireless data transmission. The possible applications of harnessing the properties of LEDs to successfully send data are, of course, endless; however, for anyone involved in the live entertainment and installation industry, the prospect of transmitting data via an LED light source would be nothing short of revolutionary. Once established, this technology could change the way every sector of the industry functions. As Professor Haas himself explains: "With more than 1.5 million cellular base stations and more than 5 billion mobile phones in use around the world, mobile broadband is an essential part of modern life - easily comparable to electricity and clean water supply. Mobile devices already produce about 600 terabytes of data (about 128,000 DVDs) every month - and that number is expected to grow exponentially over time. As a result, there is a looming shortage of radio frequency spectrum." "Professor Haas may come from outside the traditional speaker network of our industry," comments PLASA CEO Matthew Griffiths, "but I am genuinely thrilled to have secured a keynote presenter of his standing. This new vision of how we can harness the energy of the now ubiquitous LED light source could fundamentally alter the live entertainment and installation industry. Might we now be able to overcome the immediate problem of the radio mic spectrum? That could be only one of many important contributions this technology might bring. The evidence that LEDs can do so much more than just light a stage or a show, leads us to question if the time is coming when sound and light will become one unified, interconnected use of energy for live events." Professor Haas will be speaking in the Bury Theatre on Tuesday 30 April at 4.55pm. This promises to be a presentation that will leave every member of the audience reassessing everything they know about how energy is used in relation to data transmission and how this technology could impact on them, both professionally and personally: a really unique opportunity not to be missed. 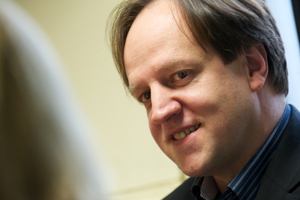 To book your free place for Professor Haas's keynote speech please visit the PLASA focus website. You must register as a visitor before booking. We advise that you book early as seats will be allocated on a first come first served basis.